Glaswegian comic Stuart Mitchell’s sharp one-liners, brilliant turn of phrase and clever wordplay made him a perfect choice to Stuart Mitchellsupport Stewart Francis and Hal Cruttenden on their national tours. Stuart was tipped to have a promising future after his first ever gig when the judging panel of the UK’s biggest comedy competition gave him special mention for an “amazing performance”, opening with a line acknowledged by one of the judges to be “possibly the best first line of a first gig ever”. 2010 saw him win the Leicester Comedy Festival New Act of The Year Competition. In May of that year he became an “internet sensation” (Daily Record) after he appeared on Frank Skinner’s Opinionated TV show receiving a standing ovation by panel members Patrick Kielty, Sarah Millican and Skinner with the BBC using it as one of their highlight videos on YouTube. 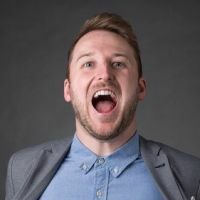 As well as being a comedy performer and writer Stuart is studying acting at Royal Scottish Academy of Music and Drama and has a number of TV appearances including being the focus of a Channel 4 documentary “Tricky Business” and was recently the face of a nationwide organ donation campaign. Other acting credits include In Search Of Bible John (STV) and Tricky Business Series 2 (Channel 4). Stuart has also recently written for BBC’s Mock The Week.